Another good friend and someone I respect for his wonderful writing on cinema, Mark of Three Rows Back, felt the exact opposite toward director Frank Darabont‘s film adaptation of The Mist. His comment, “I’ve never read the book so guess I can see it from an entirely unbiased perspective but I’ll stand up for that movie, and its ending, all day long.”, was one I always enjoy because it’s passionate. Film always converges those on polar ends, and think it great to explore others’ ideas on the subject. I’ll offer and update my reasoning behind my quiz answer, and I sincerely hope Mark, and any other reader, will respond with his in kind. I’m likely one of those that meets the pissed criteria when it came of the movie adaptation of The Mist (2007), and thought I needed to offer a contrary opinion. 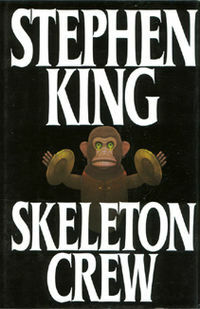 Stephen King’s original story, a horror novella, was first published as the longest story in the anthology novel, Dark Forces (1980). A few years later an updated version re-surfaced from his short story collection, issued as Skeleton Crew (1985). It still did not have the ending that Frank Darabont added to his film adaptation. Naturally, a Spoiler Warning from this point forward for those who’ve not seen the film or read the novella. Brief Story Scenario: David Drayton and his small family awaken to the aftereffects of a violent, sudden overnight thunderstorm upon his lakeside home. Noting a strange mist that has set upon the lake, edging slowly toward his Bridgton, Maine town, he sets off with his son Billy for supplies. Reaching the supermarket nearly the same time as the mist, it becomes apparent this is not ordinary fog. For “the mist” is alive, seething with unearthly sounds and movements. Concealing numerous species of bizarre creatures, which viciously attack anyone and anything that ventures out into the open, trapping those within the market. 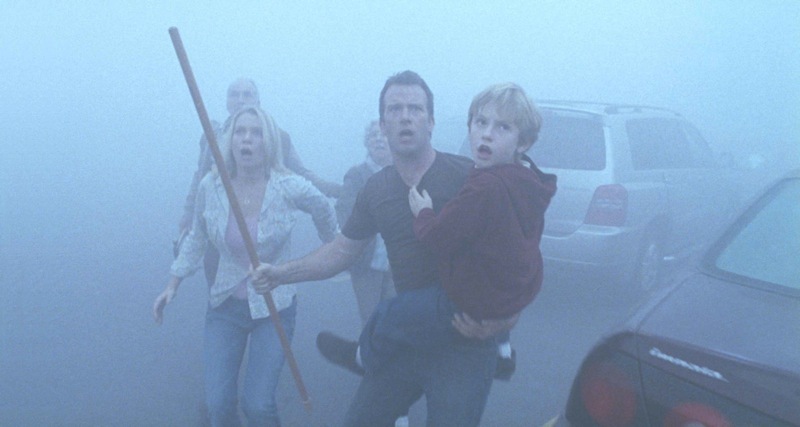 The Mist has long been a favorite of many a Stephen King fan, and likely for its H.P. Lovecraft influence. That Promethean sway of Lovecraft’s for those playing with forces they don’t understand, unleashing it through their own human folly. Here though, bent to King’s inclination toward familial perspective, the bystanders down the line caught up in the freakish mayhem left unchained. Citizens of a small town, specifically the small group trapped in a grocery store, coming to grips with that outcome. Primarily, a father and son besieged by throngs of unimaginable, horrifying, and deadly creatures somehow let loose, and the tearing of the social fabric as a result. Pretty obviously for those who read it, King’s story, which featured wildly other-dimensional, sci-fi-flavored horrors, warranted a certain kind of special effects for any cinema rendering. Unfilmable by ’80s standards, most thought, if an adaptation was to stay close to the material. Specifically, fans waiting for anything close to a worthy movie treatment sat decades until a variety of computer graphics matured, and for the right filmmaker to come along. The turn-of-the-century brought both. Frank Darabont, he of Shawshank Redemption and The Green Mile fame, seemed a choice made in heaven to shepherd another popular Stephen King tale to the big screen — let the record show I actually cheered when he was announced. Where the man went wrong, in my humble opinion, was to add his take on what was the logical conclusion to Stephen King’s quite extraordinary parental, but wildly macabre, tale. It’s been well documented Darabont sought King’s blessing beforehand for the amend. King said the director was braver than he regarding what he wrote back then, but gave it his okay, anyways. The author’s original ending, though not a clear-cut, and one even the tale’s narrator admitted was very Hitchcock-like (à la The Birds), simply fits better1. I think those, like me, who admired the windup gave King credit for this, plus the novella has stood the test of time with its popularity among the author’s written work by fans. Darabont’s more bleak culmination, with its decidedly more bitter and cruel irony, doesn’t work because the audience’s empathy and identification had been effectively built using Stephen King‘s original trajectory of the piece. 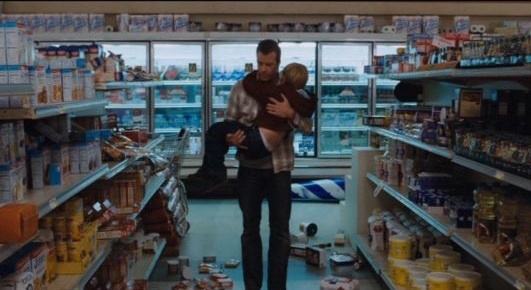 That of the father character (Thomas Jane in a wonderful performance) fighting tooth-and-nail to save what’s left of his family, his son, under the most ghastly of circumstances. Only now with the movie version, the director chose to kick the chair from under the audience at its conclusion2. Please don’t misunderstand, I praise the writer-director’s translation of novella overall. Till reaching his finale, that is. Even applaud the key element he raised from King’s original. The mother figure seeking Drayton’s and other’s help to get home and save her children. A wrenching moral crux — help rescue her kids — which might endanger your own. Leaving Billy with those in the store, or bringing him out into “the mist”, if you assist the woman. Facing hellish odds with what’s already taken place for those who’ve gone out to the parking lot or had a glimpse of what pulled the stockboy out savagely in the back storeroom. Darabont’s version goes out of his way to punish Drayton for that choice of trying to protect his own. 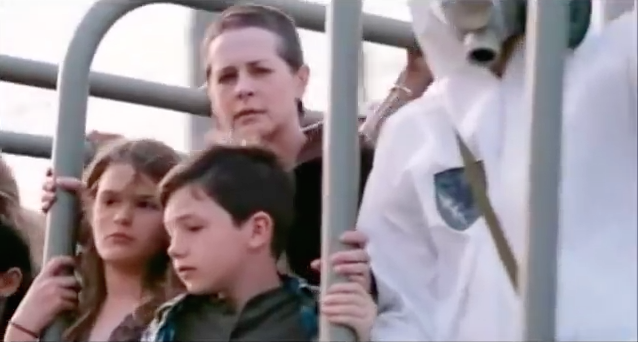 Producing for the camera said woman by the end, along with her now retrieved kids. Bequeathing David that stare.3 The Indiana Jones and the Last Crusade, “He chose poorly.”, one. Christ on a cracker! King’s original ending was clearly open-ended, and still far from a happy Hollywood ending, but I prefer it cause it makes sense within the confines of King’s story. The director’s does not. Here’s why I say that. Drayton obviously doesn’t help that woman. Not out of cowardice, but knowing he’s his son’s best chance at keeping both of them alive. Why you ‘put your own oxygen mask on first’…that, and for the other woman in the story. And we’re not talking Amanda, who David’s just met in the store, either. We’re speaking about his wife, the mother of his child. Think she’d say, “Go help her, David.”, knowing dad’s the only thing protecting their son? No, she won’t. Hard, but why he makes the decision he does. But wait, she’s not there, you say? Stephanie’s at their house, or dead, and can’t be uttering anything to her husband. Obviously, you’ve not been married…or a parent. Trust me, she’s there, in his head (like any spouse…loving or not). David will keep that unspoken promise, even anguished as he is for his wife poor chances. Stephen King rightly left it to the reader to see or imagine what lies ahead for the neo-patchwork of a family that reaches the end of the novella. Years ago, some thought it a cop-out. I didn’t, given the story’s structure the author laid out. His instinct then, correct in my opinion, was to end it like he did. The barest of hope for some, or the bleakest for others, if they so choose. King even alludes to this, though not fondly, hence that Hitchcockian reference as part of the story’s narrative. Darabont followed King’s plotting, and its emotional thread, but couldn’t leave it alone. Escaping the store, driving through the mist, David finds his house destroyed, his wife dead. Heartbroken, destruction and fantastical creatures about at every turn. Then, running out of gas, the group decides there’s no point in going on. Four bullets left in Amanda’s gun, five in the car, David shoots the others rather than have them endure horrifying deaths. Wishing for his own end, he finds the U.S. Army saving the bloody day for his trouble. Sheesh! Not look for fuel and shelter, but drive inanely on till totally out of gas (novella’s David sure doesn’t). Things are dire, but pack it all in the very first chance you get?!? Then for that rather senselessly stupid decision, Darabont will giddily show King’s character, who’s been guiding the tale, the error of his ways by rubbing his nose in it with that, “You twit! We have it all under control.”, ending. Which, if you hadn’t noticed, totally undermined both the Lovecraft and King angles of “The Mist”, thank you very much. Stephen King’s version, which I heartily recommend reading for those who’ve not4, remains the most compelling. Again, just my opinion, your mileage may or will vary. Darabont’s film in the years since has received positive reappraisal, and mainly for that wrenching whopper of an ending, which I didn’t, and shant ever, buy. Each of these variants still pack their own punch, I just prefer the one that makes the most logical sense, or maybe that’s just the father in me…just hoping…but I leave it to you to decide for yourself. October 29, 2017 Update: Simon and Schuster Audio’s May release of an unabridged audiobook of The Mist is well worth listening to. Especially with veteran character actor and voice to many a Stephen King novel of late, Will Patton, delivering to this tale another exceptional performance. This is a favorite film of mine and I felt that the ending was ingenious. Any happier ending would made it all far too easier and lacking in much thoughtful discussion thereafter. Disney would have had a far more fun ending and probably included some catchy songs along the way and cute characters that could be marketed as toys. 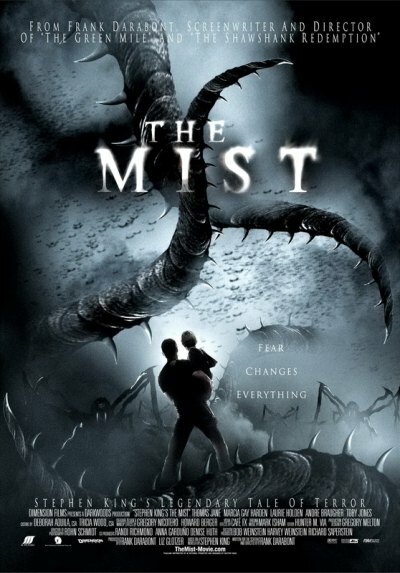 The film version of The Mist is bleak and filled with moments of decisions that keep the viewer engaged in the story line then wallops them with a troublesome ending that raises the questions of discussion such as “What would I have done in such a circumstance?” As things were all seemed to be lost and hopeless. What a crazy predicament for anyone to be in. The conclusion of the film is worthy of the best episodes of Twilight Zone. It has the irony that if it were not so sad you’d have to laugh. The Mist is a thriller as well as a tragedy such as Shakespeare might have come up with if he were here today writing screenplays. Sad ending? Yes? But in my book as perfect as they come. It makes you mad, sad, confused, and looking for another better ending if you could come up with one that is not trite, maudlin, or something out of a kids’ story. 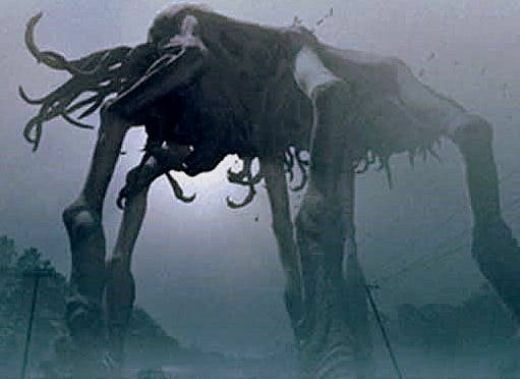 I don’t think many people who have seen The Mist can forget that ending and to me remembering a film is a sign of its greatness–especially if we continue to discuss it years after it’s been made. Great to have you joined in, Lee. And with an empassioned and positive take toward the film in question. We agree the tale keep everyone who sees it engaged, and it would be among the best of a Twight Zone episode, though my preferred ending works there, too. Plenty of open-ended finales in that series. Thanks so much, my friend. Great post! I’m a huge King fan & although I read the story, I have to admit that I don’t really remember it. I loved the movie. Yes, even the ending. But, as I didn’t really remember the story’s ending anyway, I guess the movie’s ending didn’t bother me…. Nice write up Michael. I guess I have mix feelings about this movie, I enjoyed it but like you I was kind of turned off by its bleak ending. I much prefer the book’s version but I can see why some would think it’s a “great” ending. Also, I think the special effects were some of the worst I’ve seen in a film, apparently Darabont opted for a lower budget because he refuse to change the ending and so the studio wouldn’t give him more money to shoot it. I’m more bummed because of this film’s failure at the box office, Darabont couldn’t get a studio to green light his take on Fahrenheit 451. He even got Tom Hanks to come on board as the star but this film failed so bad that the studio executives couldn’t trust him with a big budget remake. Yes, Darabont’s finale has its admirers. Come to think about, even looking at some of the clips YouTube has up, the effects weren’t exactly “great”, and certainly haven’t aged very well in the years since. Hadn’t realized he refused to change the ending and was left with these effects. Glad you mentioned it, Ted. Yeah, it was kind of a disastrous box office, the reviews rather unkind to it, too. I remember seeing this first-run, in another mostly empty theater I found myself in. Ouch! A remake of Fahrenheit 451 with Tom Hanks? Wow. That hurt. You and I, and I’m sure many other sci-fi and Ray Bradbury fans, would have flocked to a remake like that. Hello! An excellently written piece my friend. I have the upmost respect for your opinion and think it’s fantastic you have such a strong opinion about it, especially the ending. As discussed in our recent exchanges I certainly intend on viewing the film again and offering my considered thoughts on why I think the ending works. Watch this space!